Tonight, as part of the Portland Arts & Lectures "Literary Arts" series, Charles Jencks presents a slide/lecture presentation on The Iconic Building, his new book surveying modern structures that challenge the traditional architectural monument. Jencks is a seminal theorist on architecture and postmodernism. This evening, he will discuss the work of his contemporaries Frank Gehry, Norman Foster, Peter Eisenman, Enric Miralles, Zaha Hadid, Daniel Libeskind, Renzo Piano, Will Alsop, and Rem Koolhaas. A Q&A session and book signing will follow the event. Mona Hatoum stands as one of the most important British artists of her generation. You may have seen her humorous photographs and small-scale sculptures in the project room at the Affair last month. Through the hard work of Stephanie Snyder and the Coolley Gallery, we are fortunate to have her and her work in Portland. 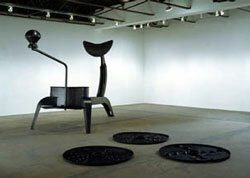 Hatoum emerged onto the British art scene in the 1980s during the brouhaha of the YBA (Young British Artists) movement. Since that time she has been exploring the cultural dynamics of immigration, gender, and physical and psychological displacement,often using the personal space of the body and its products as a context for broader cultural and political concerns. Tomorrow night, she talks about her work, which has ranged from physically extreme public performance in her early years to more recent video, photography, and mixed media sculpture. This is one not to be missed! I met a really kind person tonight who gave me directions to the lecture hall and she also gave me a card for this site. I was hoping to see examples of her installations here? Anyway, I loved the lecture tonight. I like how she spoke of the work being more about ideas than the craft. The word visceral sprang out at me, I have been trying to think of that particular word. Someone asked her why she wanted to provoke such extreme emotion in her audience and she was tired and drew a blank. I think as artists, we not only want to have people think about our art, we would like to get that sort of gut reaction to our work. It was a good lecture to a packed house... Portland loves lecture series and I'm certain you will be seeing more on Hatoum here soon. Also, I agree some of the questions were just plain odd but that happens. In my opinion the best aspect of her work is the visceral reaction her best work produces... some of the more simple visual puns just look dated but the most visceral experences like "Light Sentence" or "The light at the end" (with its resister wire heating elements) are really powerful, poetic installations. Her focus on the body of the viewer being put in a state of unease and curiousity at the same time are what elevates her work above some of the weaker shock jock YBA stuff. Still, her visual pun stuff seems to be what connects her work to the YBA movement and I think Tracey Emin and Sarah Lucas do that sort of thing better. Light sentence was one of my favorites. I also was really drawn to the two wire chairs. The looked like a mother and child and yet somehow that attachment conveyed the uncomfortable nature of that locked closeness. I am so happy exploring your site...you guys have put a lot of work into this place, it is like you spent the time gathering the feast... it is left to us to partake of it.